It's been a while since we published news on Asset Forge, rest assured however; a new version is in full development! We've invited community members (and experienced programmers) BeefEX and Haddicus to join development, they've been given the source of the original Asset Forge build and will work on the new version from scratch. The new version includes basic features that were missing from the first few releases including copy/paste, undo/redo and confirmation dialog. It'll also improve performance and re-introduce features like larger 2D exports. There's no estimate when the new version will hit but to close the gap we'll soon (within a couple of weeks) release a intermediate version of Asset Forge that will only introduce new blocks to build with. Adding features to the current version is unwise because of the impending 'from scratch' version. In the meantime, check out a preview of some of the new oriental themed blocks. Hope you're as excited about the update as we are! Is this all vertex color? Hey, I just bought it, and it's awesome. One thing, on my laptop which have switchable Intel GPU + Nvidia GPU. AssetForge starts using 100% of Nivida GPU and laptop's fan goes full speed. Is it suppose to use 100% GPU when running? Should I run it with Intel GPU instead to keep laptop cool? Looks great! sad i cant get it, my I lost my itch.io account password and i forgot the email also, and my dad wont lend me his paypal info! is there any way i can prove that i currently have a outdated ver. 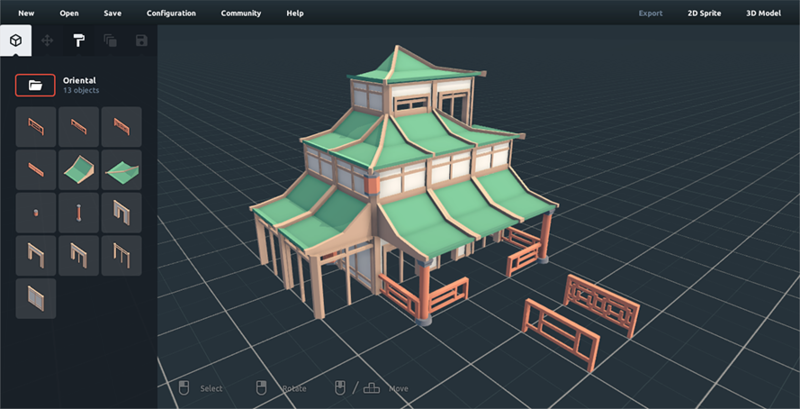 of Assetforge and get this version free? please trust me..
thanks for the update, looking forward to it. The philosophy behind this program is fantastic, but the current version is definitely hamstrung by those limitations. I would hesitate to really try to use it for a project until the new version is out. Would you advice that i purchase the deluxe version now or wait till this new version is out? FYI: I do not mind waiting. Asking so that i do not do a double purchase. Will this new version be a new software or an update to the actual version? Will we need to buy it again? Don't worry, it will be new version of the same software. We are only starting from scratch due to technical reasons. Will the new version support model files from the old version? Absolutely, there will be no change in model compatibility.